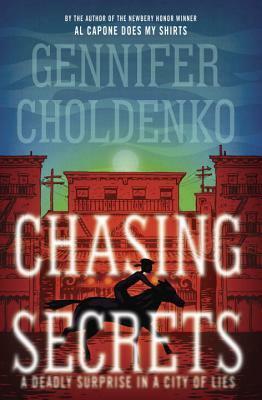 In Chasing Secrets, author Gennifer Choldenko returns to historical fiction set in San Francisco with Lizzie Kennedy’s story set in 1900. Lizzie is stifled at Miss Bartow’s School for Young Women, the school her wealthy aunt insists she attends. She does not feel truly alive until she is leaving the school for the day. If she could, Lizzie would far rather accompany her father each day. He is a physician struggling to make a living, taking on the patients the more well to do doctors do not. With her father, Lizzie can fully engage in her passion for science and medicine. Lizzie’s brother Billy used to be the one at their father’s side on rounds, but no longer. Lizzie often reflects on the bond she used to have with her brother and her frustration with the changed, moody young man he has become. Jing is the family cook, but he is also far more than that. Lizzie cannot imagine life without him. Rumors circulate San Francisco of a plague despite the authorities attempt to disregard them. Chinatown is placed under quarantine with Jing still inside. It is then that Lizzie begins to learn there is much about her family’s servant and the world she does not know after she discovers Noah, a Chinese boy hiding in Jing’s room. She never knew Jing had a son nor the role Jing plays in Chinatown. Lizzie is determined to free Jing from the quarantine. She tries to use her uncle’s connections as he runs one of the San Francisco newspapers; she tries entering Chinatown herself. As a reader, I admired her persistence as she works to figure out a way, any way, to rescue Noah’s father from the quarantine. What she sees along the way makes her more convinced then ever that the plague is in the city. Yet the newspapers and doctors all deny it. Like her Al Capone trilogy, she has crafted memorable characters against a backdrop of research. I highly recommend this middle grade novel for its elements of mystery and suspense. Before reading this fascinating book, I had never heard of a bubonic plague outbreak in California. Choldenko weaves medical understandings of that day throughout the book. The tension and suspicion between cultures almost feels like a character in the book. The developing friendship between Lizzie and Noah transcends the boundaries between race and gender at the turn of the 20th century. Noah scoffs at the idea of a girl studying medicine in college while holding fast to his dream of attending college. I read Chasing Secrets as an electronic ARC on NetGalley. Chasing Secrets is scheduled for release on August 4, 2015.